The dsp.IIRHalfbandDecimator System object™ performs efficient polyphase decimation of the input signal by a factor of two. To design the halfband filter, you can specify the object to use an elliptic design or a quasi-linear phase design. The object uses these design methods to compute the filter coefficients. To filter the inputs, the object uses a polyphase structure. The allpass filters in the polyphase structure are in a minimum multiplier form. You can also use the dsp.IIRHalfbandDecimator object to implement the analysis portion of a two-band filter bank to filter a signal into lowpass and highpass subbands. Create the dsp.IIRHalfbandDecimator object and set its properties. iirhalfbanddecim = dsp.IIRHalfbandDecimator returns a halfband decimator, iirhalfbanddecim, with the default settings. Under the default settings, the System object filters and downsamples the input data with a halfband frequency of 22050 Hz, a transition width of 4100 Hz, and a stopband attenuation of 80 dB. iirhalfbanddecim = dsp.IIRHalfbandDecimator(Name,Value) returns an IIR halfband decimator, with additional properties specified by one or more Name,Value pair arguments. Example: iirhalfbanddecim = dsp.IIRHalfbandDecimator('Specification','Filter order and stopband attenuation') creates an IIR halfband decimator object with filter order set to 9 and stopband attenuation set to 80 dB. Internal allpass filter implementation structure, specified as 'Minimum multiplier' or 'Wave Digital Filter'. This property applies only when you set 'Specification' to 'Coefficients'. Each structure uses a different coefficients set, independently stored in the corresponding object property. Allpass filter coefficients of the first branch in Wave Digital Filter form, specified as an N-by-1 or N-by-2 matrix. N is the number of first-order or second-order allpass sections. Each element must have an absolute value less than or equal to 1. Allpass filter coefficients of the second branch in Wave Digital Filter form, specified as the comma-separated pair consisting of 'WDFCoefficients2' and a N-by-1 or N-by-2 matrix. N is the number of first-order or second-order allpass sections. Each element must have an absolute value less than or equal to 1. This property applies only when you set 'Specification' to 'Coefficients' and 'Structure' to 'Wave Digital Filter'. This property applies only when you set Specification to 'Coefficients' and HasPureDelayBranch to 1.
ylow = iirhalfbanddecim(x) filters the input signal, x, using the IIR halfband filter, iirhalfbanddecim, and downsamples the output by a factor of 2. [ylow,yhigh] = iirhalfbanddecim(x) computes the ylow and yhigh, of the analysis filter bank, iirhalfbanddecim for input x. A Ki-by-N input matrix is treated as N independent channels. The System object generates two power-complementary output signals by adding and subtracting the two polyphase branch outputs respectively. ylow and yhigh are of the same size (Ko-by-N) and data type. Ko = Ki/2, where 2 is the decimation factor. Data input, specified as a column vector or a matrix. The number of rows in the input signal must be even since the decimation factor is always 2 for this object. If the input is a matrix, each column is treated as an independent channel. 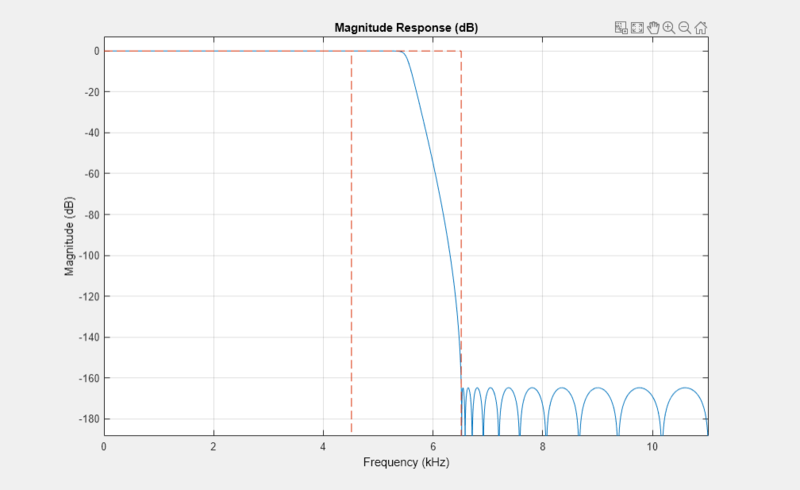 Create a minimum-order lowpass IIR halfband decimation filter for data sampled at 44.1 kHz. 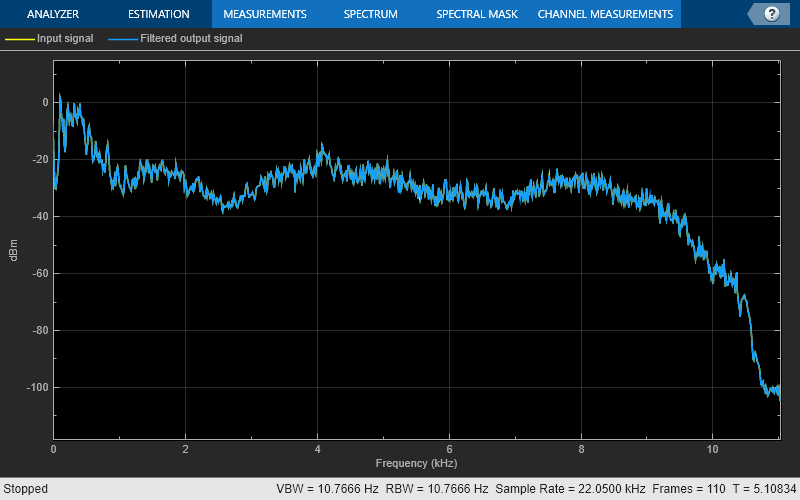 The filter has a transition width of 4.1 kHz, and a stopband attenuation of 80 dB. Filter a two-channel input into lowpass and highpass subbands. When you filter your signal, dsp.IIRHalfbandDecimator uses an efficient polyphase implementation for halfband filters. You can use the polyphase implementation to move the downsample operation before filtering. This change enables you to filter at the lower sampling rate. 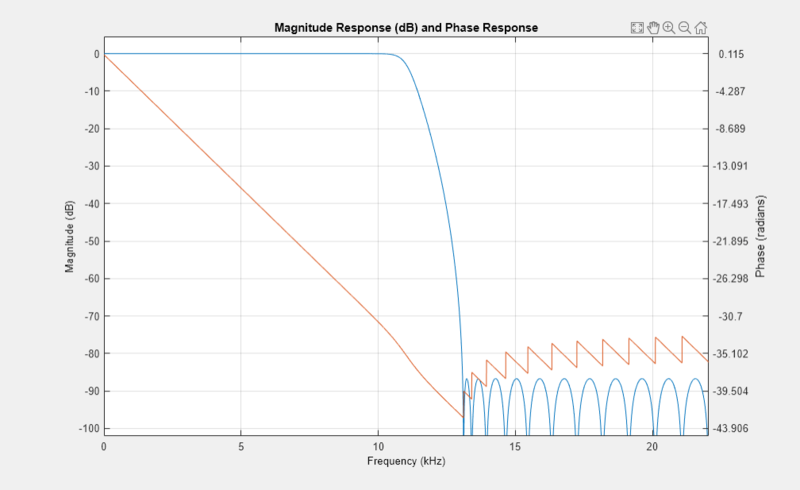 To achieve a near-linear phase response for IIR halfband filters, make one of the branches a pure delay. In this design, the cost of the filter increases. where k is the length of the delay. This figure represents filtering and downsampling the input by two. Using the multirate noble identity for downsampling, you can move the downsampling operation before filtering. This change enables you to filter at the lower rate. To implement the halfband decimator efficiently, dsp.IIRHalfbandDecimator replaces the delay block and downsampling operator with a commutator switch. Graphically, you can represent the analysis filter bank as follows. dsp.IIRHalfbandDecimator generates two power-complementary output signals by adding and subtracting the two polyphase branch outputs respectively. Decimates the input prior to filtering. Acts as an analysis filter bank. Has non-linear phase response and uses few coefficients with elliptic design method.